Catch the attention of a prospective employer with an eye-popping video resume or video profile. Creating a video resume is an excellent way to showcase your personality and communication skills and stand out from the competition. The following guidelines will help you create the perfect video resume. Think about what you want to present and all the information you want to include. Create an outline of your video resume and map out what you want to say. Film multiple takes, if necessary. Try delivering your content in various ways and make sure your information is presented logically. A video that flows well is easier to watch. Practice before recording for a more natural delivery. Simply reading bullet points from your physical resume may come off as stiff, forced and unnatural. Show, don’t tell. Using the video format allows you to be creative with visuals. Video gives you the opportunity to demonstrate who you are. Find a creative way to show who you are. After outlining your video, write a script. When you finalize the main points you’d like to convey, try to find clear ways to say them. Use a script but don’t read from it directly or your video will be dull. Extemporaneous speaking, without planning, often leads to awkward pauses, excessive use of “um” and run-on sentences. Have a sense of what you want to say, and how you want to phrase it. Quality counts! Make sure you can be seen and heard. Choose a well-lit setting and reduce background noise. Poor sound and visual quality videos will be dismissed immediately. Take two! Or three… or four. Shoot as many takes as necessary to get the best performance. You don’t have to settle on a bad take. Video gives you the means to present yourself in the best light possible. Check your work. Watch your video before sharing or sending it to catch mistakes. Think of this as a “proof-reading” pass, just as you would a document or e-mail. Perhaps you have included run-on sentences, awkward pauses or overused a word. Take the time to clean it up. Easy-to-use and intuitive video software is available. Changing angles and camera shots will add visual interest. Use titles, subtitles, and graphics to add appeal. Hiring managers are looking for creativity and personality as well as content. A video resume may not be relevant or appropriate for the job to which you are applying. If you’re seeking a role in a creative profession, such as design, marketing, or social media, then a video resume may land you an interview. Sending a video to the wrong type of company may do more harm than good. A static, single shot, single take video may play as boring. A visual medium should be visually interesting. Cut to another angle, another image or another location. Remember, you are selling you. An employer can always find someone more qualified or with more experience, but you are the only you. Personality will differentiate you in the field of applicants. What sets you apart from other candidates? In addition to your personality and experience, highlight your relevant skills and qualifications. Integrate important keywords for your target industry. As you would in a traditional resume, communicate achievements to impress employers. Mention promotions, awards, grants and scholarships you have received. Demonstrate how your contributions in a previous job lead to specific results. Include numbers, dollar amounts and percentages! An interesting video will be the most compelling reason for a hiring manager to keep watching, so be creative! Consider filming yourself in action to demonstrate your brand and accomplishments. Use relevant props and production techniques such as voiceovers, split screens and transitions to keep the viewer interested. The advantage of a video resume is the ability to showcase your personality and strengths, so present yourself with confidence. Eye contact, the quality of your voice, and affable demeanor will keep the viewer engaged. Presentation matters! Details matter! Make sure that producing a video maximizes the benefits of using visuals to sell you. Display your contact information so you can easily be reached. Don’t let the video format allow you to get casual. Maintain a professional demeanor, dress as you would for a formal, face-to-face interview, and avoid cursing and slang. Keep your setting in mind, too. Make sure the background is also quiet and appropriate without be sterile and boring. When making a video it’s easy to forget about copyright infringement. Red flags may be raised if you use any trademarked images, such as corporate logos, or music. Be careful when using supplemental content. Who is your video for? Who will be watching? Are you tailoring the video to a specific industry? You may have a different approach if applying for a bank job versus a social media job. Consider who will see the video as you plan and create your script content, production style and filming locations. Adjust accordingly for the perfect presentation. Your talking head may not be enough to land you the gig. Video is a visual medium, so take advantage of visuals to illustrate what you’re saying. Showcase your talents and skills with appealing and inventive graphics. If you have a long career history with many accomplishments and achievements, you may have a lot to say. But videos that go on and on will likely be dismissed. Create a video between 30 to 90 seconds. Leave them wanting more! Creating and submitting a video without first getting feedback from friends and family is a mistake. Solicit feedback from others who know you. Ask people to watch with a critical eye and make suggestions for improving your video. You may want to include video testimonials from former co-workers and past bosses directly in your video to assist hiring managers in making their decision. 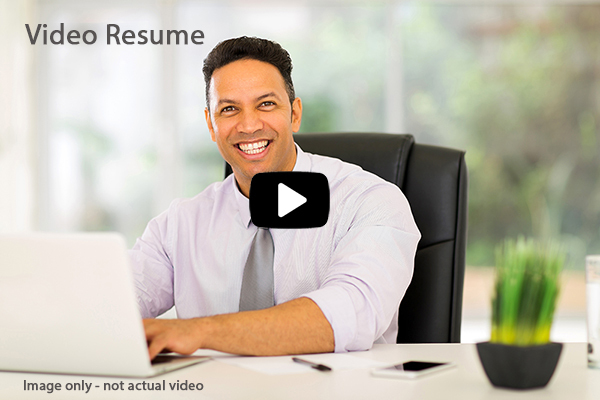 A video resume can be a beneficial job search strategy. Send your video resume to hiring managers, post to social media or on your professional networks. Include a URL on your physical resume and business card. Good luck!